Since the appearance of the vegetative-propagated Thunbergias on the market, these plants are celebrating a real renaissance. They are tender perennials, but are mostly grown as annuals because they grow quickly and produce flowers the first season. The showy, funnel-shaped flowers stand out above the arrow-shaped leaves. 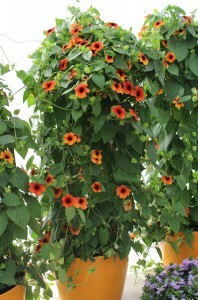 This vigorous, low maintenance vine serves well as a screen when encouraged to climb on a trellis or fence. 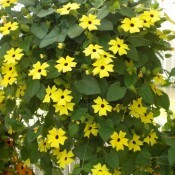 It is also useful as a trailing plant for window boxes, urns, and hanging baskets. Cultivate Thunbergias in a warm spot and protect it against drafts. These vibrant apricot coloured blooms with dark centers will brighten up anyones day. Either on a trellis or as trailing plants in a container, this vigorous, low maintenance vine produces brightly coloured flowers all summer. 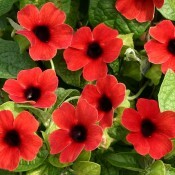 These vibrant rich red coloured blooms with dark centers will add interest and intrigue to any garden. Either on a trellis or as trailing plants in a container, this fast growing vine produces brightly coloured flowers all summer. They are easy to care for and easy to grow. 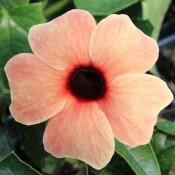 The Sunset blooms are a unique cream and orange with darker reddish centers. 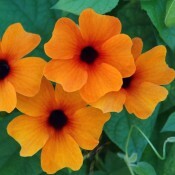 These flowers add colour and charm to any garden. Either on a trellis or as trailing plants in a container, this vigorous, low maintenance vine produces brightly coloured flowers all summer. They are easy to care for and easy to grow. 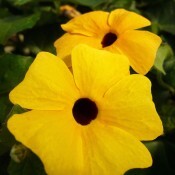 These vibrant canary yellow coloured blooms with dark centers will brighten up any garden. Either on a trellis or as trailing plants in a container, this vigorous, low maintenance vine produces brightly coloured flowers all summer. They are easy to care for and easy to grow. These intense red-orange blooms with dark centers will brighten up anyones day. Either on a trellis or as trailing plants in a container, this vigorous, low maintenance vine produces brightly coloured flowers all summer.